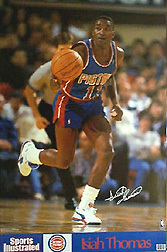 11 by 17 inch mini poster of former Detroit Pistons superstar Isiah Thomas issued by Sports Illustrated in 1990. Prefolded, in perfect condition. ONLY ONE AVAILABLE FOR SALE.